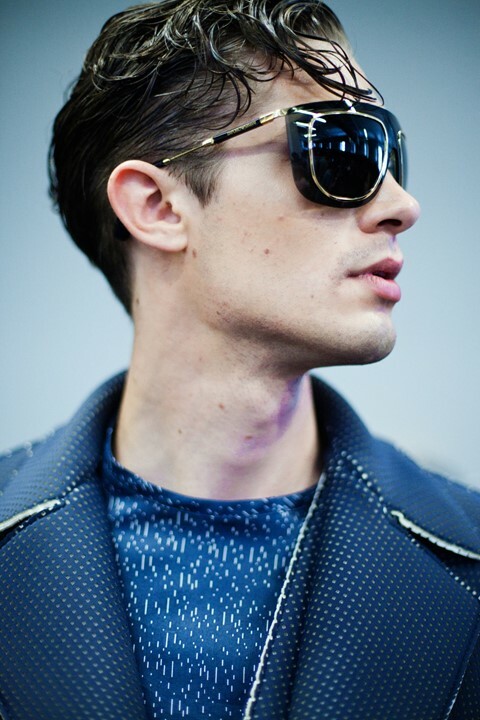 In true Italian style, Emporio Armani this season delivered slick tailoring, modernised with sci-fi associations. Elements of futurism were apparent with oversized visors, black-out frames and transparent lace-up shoes - whilst Armani’s model army emerged on the illuminated runway in head-to-toe stark white looks. Sheer tops, zip-up jackets and flashes of flesh underneath open blazers drew attention to the athletic appearance of the models. There was a discrete honeycomb print on solid and sheer fabrics and dashes of silver metallic that injected ideas of digital imagery. Sleek sportswear references and Armani’s signature eveningwear ensembles were in a minimalist colour palette that transcended from navy to black to beige to white to grey with bursts of fuchsia and emerald interrupting towards the end. For the finale, polished women joined Armani’s swarve gentleman in silky looking suits and mid-length dresses.